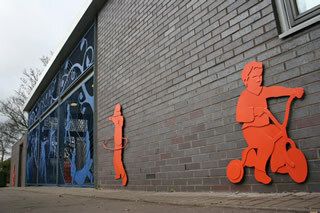 Scartworks worked with Wigan based artist Mark Mennell to create a new and more appealing facade to the Higher Blackley Sure Start Centre in Manchester. Marks original artwork was the culmination of several imaginative workshops with the children, parents and staff of the centre. œMy goal was to produce an exciting and vibrant new facade which would reflect the range of activities within the centre said Mark. To these ends we carefully translated Marks original artwork and created a robust galvanized steel screen with additional figures. Scartworks worked in partnership with Manchester City Council and Bramall Construction Ltd. to ensure the finished product was installed by competent operatives in a safe working environment.